I have recently been reacquainted with the amazing world of picture books. This past year, while trying to catch up with the Nerdy Book Club short list, I remembered that picture books can be used in any age group - for any topic. 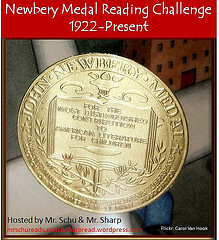 I'm trying to share some of the nonfiction books here on the blog, and link up to Kid Lit Frenzy's weekly posts on Wednesdays. 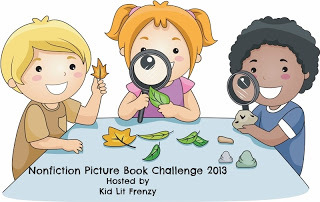 Be sure to visit that site for more wonderful NF picture books! 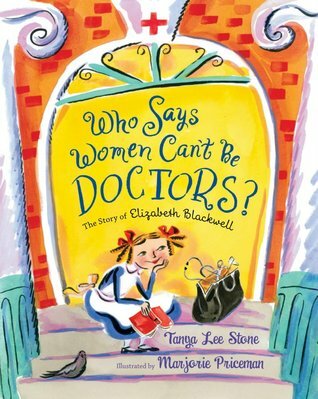 But Elizabeth refused to accept the common beliefs that women weren’t smart enough to be doctors, or that they were too weak for such hard work. And she would not take no for an answer. Although she faced much opposition, she worked hard and finally—when she graduated from medical school and went on to have a brilliant career—proved her detractors wrong. This inspiring story of the first female doctor shows how one strong-willed woman opened the doors for all the female doctors to come. With a mom who went to medical school while I was in middle school, this book was an easy decision for me to grab. I love the way the story begins, "I'll bet you've met plenty of doctors in your life. And I'll bet lots of them were women." I wonder how many kids today realize how hard women had to work to break into the workforce - let alone into jobs in the sciences? The text is simple, but gives us enough information at each of Blackwell's life stages to get a flavor of the way her life must have been. A feel for the type of adventurous girl she was at the start, the type of girl who "never walked away from a challenge". Ahh... the illustrations! I adore the brightness and energy that shine through the drawings and the lettering. I can just feel Elizabeth Blackwell's passion for life through Marjorie Priceman's work. Marvelously well done. Great read aloud - with bright and lovely illustrations on every page. Mentor Text for creating their own biographies. Wouldn't YOU rather read a simple picture book they created instead of all those horrific five paragraph essays? 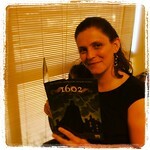 A picture book! Partner kids up with strong artists on each team, or allow them to use clip art as needed. ** Start with some childhood anecdotes that illustrate personality and temperament. ** Describe the motivations / reasons she had for the main life path she took. ** Build in the obstacles she faced on the way to pursuing her dreams and how she overcame them. ** Describe the preparation she required to make her dreams come true. ** End with the biggest impacts she had on the world we know today. ** Include an author's note with other information, a personal statement on how the author (student) feels about the historical figure, and the sources. Viola! Much better than those cookie cutter essays, right? I loved this book, and you and your students will too.